The Great Plains at the time of the European contact. The Great Plains could be an intimidating place. Often parched and dry in the summer, with hot winds that seemed to never abate, winter brought blue northers, which could drop the temperature forty degrees in an hour, and roared out of the darkening sky without warning bringing stinging ice and blankets of snow to the treeless steppe. It was a vast and seemingly empty space about 500 miles east to west and 2,000 miles north to south, reaching from tall-grass prairies of the American mid-west to the foothills of the Rockies and from Texas to Canada. Millions of years before man, during the Cretaceous Period, a shallow inland sea had covered the plains. When it receded, evolving into grasslands, it eventually supported grazing creatures such as horses, mastodons, giant sloths, and mammoths and the carnivores that preyed on them, American lions and sabre-toothed cats. The first humans on the plains probably came over the Bearing Straits land bridge about 15,000 years ago, and in time a distinctive culture developed among the peoples whose sustenance relied on the great bison herds that traversed the grasslands. The Spanish conquistador, Francisco Vázquez de Coronado, noted the first encounter of Europeans with the Amerindians of the Great Plains in 1540-42. 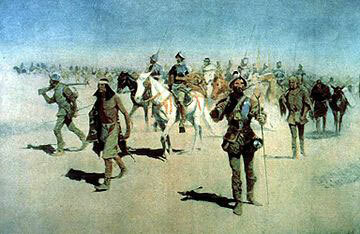 Fredrick Remington’s depiction of the Coronado Expedition. Coronado called the natives Querechos and described the people as nomads who followed the bison herds. They lived in tipis in communities that could number a thousand or more residents. Modern anthropologists generally agree that the Coronado’s Querechos were Apache. Next came the Comanche. One hundred years or so after Coronado, the Comanche separated from the Shoshone people living along the Platte River in Wyoming. When they first acquired horses, probably from the Pueblo who had taken them from the Spanish, they begin to migrate south following the buffalo herds and on the search for more horses from the early Spanish settlements in New Mexico. By 1700 they had bumped up against the Lipan Apaches on the llano, and in a series of wars pushed them off the escarpment and south to the Rio Grande and northern Mexico. 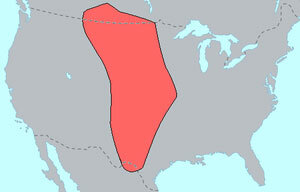 For the next 150 years the Comanche, along with their occasional allies the Kiowa, dominated the Southern Plains. They hunted the buffalo and raided deep into Mexico taking captives, plunder, and horses. So great was the disruption of these depredations that Spanish then Mexican development in the northern tiers of New Spain was severely limited. 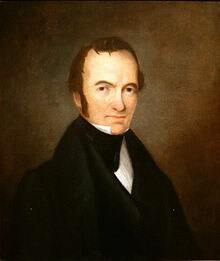 One of the principal reasons driving the Spanish and later Mexican governments to offer land and encourage settlement by the Americans and men such as Stephen F. Austin, was the hope that the Anglos would provide a buffer against the Indians. This hope proved somewhat successful. The Americans, and the Texians they became, resisted rather than avoided or acquiesced to the incursions into the populated eastern third of Texas by the Comanche. They fought back, and by the early days of the Republic of Texas the introduction of Samuel Colt’s repeating revolver began to give the Texians parity and then the dominance of firepower in the struggle. When the Texas joined the Union in 1845, the task of defending the frontier line fell to the U.S. Army, and by the end of middle of the 1850s the army was starting to make a difference. After the Mexican War, the government had set up a string of forts along the immigration routes to the western territories to protect the travelers and hold the plains tribes away from the settlements in the eastern third of Texas. When the Civil War begin, these posts had been abandoned. 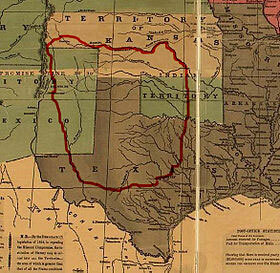 With considerable bloodshed, the Indians took advantage of the situation to reassert their dominance and pushed the Texas frontier line back to the east nearly one hundred miles in the process. When the internecine war between the Americans ended in 1865, the soldiers in blue came back to Texas with orders to end the fighting in the region, indeed, along the entire western frontier. The result was a Peace Commission that met with five thousand Indians on Medicine Lodge Creek near Fort Larned, Kansas in the fall of 1867. Most of the tribes accepted the terms. Satank, Kicking Bird, and Satanta signed for the Kiowa, Little Raven for the Arapaho and Black Kettle, Little Robe and Tall Bull for the Southern Cheyenne. Iron Mountain, Horse Back, and Ten Bears represented the Comanche. 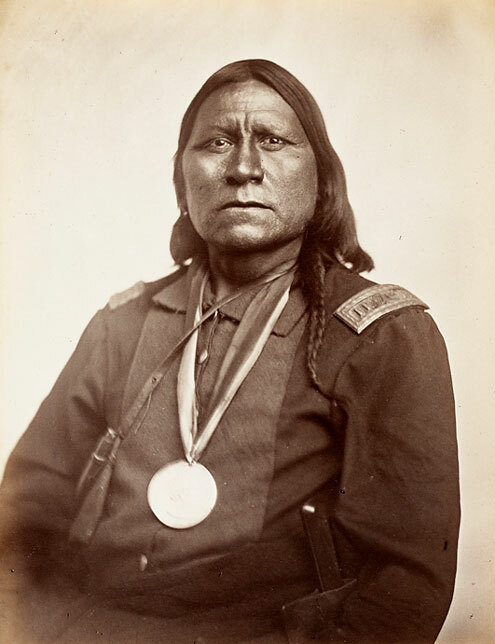 Almost every Indian leader of note, save Red Cloud of the Sioux, agreed to the treaty, and on January 7, 1868, the commission announced that at long last there was peace on the Southern Plains. They were overly optimistic; there was peace of a sort, but not for long. The railroad reached across the continent a year later, and the cheap transportation it brought made it profitable to ship hides to the east to a country that was clamoring for buffalo robes, and in 1870, tanners developed a new process to turn buffalo hides into high grade industrial leather. Whether it was a sudden twist in fashion or a growing economy that needed leather belts to drive its machinery, the reason was secondary; in short time the Southern Plains were swarming with hiders on the hunt for buffalo pelts. The numbers stagger the imagination; thousands, hundreds of thousands, perhaps millions of buffalo were killed, their carcasses left to rot once they were skinned. In only a few years the herds, which once seemed a rumbling sea of animals as limitless as the oceans, were hunted to the edge of extinction. Holding the Indians on the reservations had always been a difficult business, even in the best of times. More than once since the Medicine Lodge Creek Treaty the army had been called out to deal with bands that had bolted the Territory and ventured onto the llano bent on forays of raiding and hunting. As the buffalo drained away under the hunters’ long rifles, the situation grew worse. There were a series of incidents that galvanized the army into greater action against the tribes. Raids against ranches and drovers on the edges of Comancheria, the Warren Wagon Train attack in 1871, and the arrest, trial, and imprisonment of the Kiowa chiefs who had lead the incursion that followed escalated the tensions. 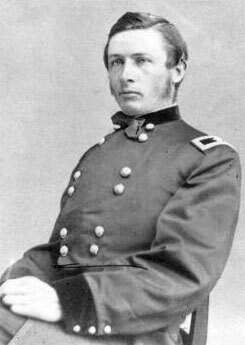 Colonel Ranald S. Mackenzie as a Brevet Brigadier General in the Civil War. In September, Colonel Ranald Mackenzie took eight companies of the 4th Cavalry, two companies of the 11th Infantry, and twenty Tonkawa scouts into Comanche country on the White River and Blanco Canyon and in October succeed in pushing the Indians off the Cap Rock and onto the llano to the vicinity of what is now Plainview, Texas. The soldiers’ quarry escaped, though not without the loss of hides, tools, and most of their possessions. The army continued pursuit until an early norther swept the plains, brought temperatures plunging, and forced a suspension of operations. The troops then withdrew to Fort Griffin and Fort Richardson. The next spring, Captain Napoleon Bonaparte McLaughlin led a two-month reconnaissance in force that located the Comanche camps on the llano, and confirmed that the army could indeed maneuver and fight on the hither to fore hostile ground. Acting on this information, Col. Mackenzie put the 4th Cavalry back in the field in September and again drove into Comancheria. At McClellan Creek in Gray County the army surprised a village of Kotsokeka Comanche, and captured more than one hundred women and children and a thousand horses. The Indians got most of the horses back in a daring raid on Mackenzie’s camp, but the army used the captives as a bargaining chip to free white captives held by the Comanche and force many of the warriors back to the reservations in the Indian Territory. 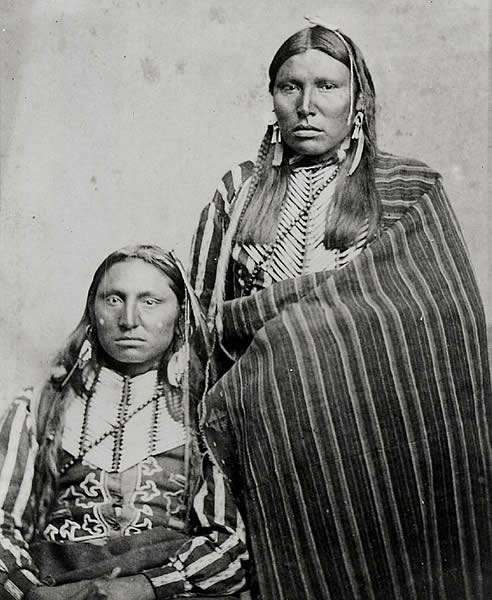 Two Comanche warriors in 1874. Comancheria had been penetrated and was no longer a sanctuary. The army was learning a new way of war against the plains tribes and these lessons would prove fruitful when the final phase of the struggle, dubbed the Red River War, began in the summer of 1874. Next: The Red River War of 1874-75.